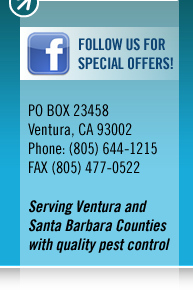 Service plans and ongoing maintenance from Shoreline Pest Control in Ventura and Santa Barbara counties. Includes interior & exterior treatment for ants, spiders, roaches, crickets, earwigs and spider web removal from walls windows and accessible eaves. We offer quarterly and monthly plans, based on your needs to eliminate all of your pests.